New CSS Features That Are Changing Web Design — Widely available, but relatively new, Web technologies like CSS Grid, CSS custom properties, CSS shapes and CSS writing-mode are allowing designers to exercise creativity in all new ways. Zell Liew explains how. Container-Adapting Tabs, with a "More" Button — You could call this a ‘progressively collapsing’ navigation menu. It’s a neat way to handle a wide variation of horizontal viewport widths if you have a lot of items you need to present in your navigation. 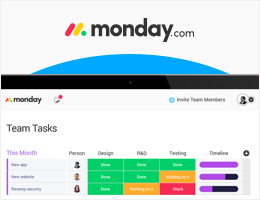 The New Generation of Project Management Tools Is Here and It’s Visual — monday.com is a visual tool your team will actually enjoy using. It makes it fun and easy for everyone to collaborate, focus on what's important, and get more done. A project management tool that’ll help you and your team collaborate and achieve more together. layerJS: UI Composition and Animation in Pure HTML — Work with UX patterns and controls like menus, sliders, parallax effects, and zoom effects by declaring them as visual effects in HTML attributes. Inspecting Animations in Chrome DevTools — A quick demo of what Chrome’s Animation panel has to offer if you want to spy on how CSS animations/transitions work. Welcome to the Immersive Web — A look at how the browser is becoming a platform for virtual world experiences thanks to WebXR (and, once, WebVR). Software Engineer - London, UK — Frontend engineer wanted to help build the future of online trust. Join our group of engineers who take pride in the software we ship. Front-End Expert? Sign Up for Vettery — Top companies use Vettery to find the best tech talent. Create your profile to get started. Decorating Lines of Text with 'box-decoration-break' — Styling inline boxes split over multiple lines can be tricky, but box-decoration-break can give you more options. Extracting a React Component: On Demand Tutorial — Attendees couldn’t believe we offered this at no cost - catch up here with Josh Skeen's tutorial replay. HTML5's Global 'hidden' Attribute — hidden is an attribute you can use on any HTML element to, well, hide it, and a worthwhile alternative to display: none in many situations. Selection: A Library to Enable Visual DOM Selection — For example, if you want users to be able to drag a box around various elements they want to select. Touch device friendly. Announcing Babylon.js v3.2 — An open source framework for creating powerful 3D experiences in the browser. Impact, the HTML5 Game Engine, Open Sourced — Anyone building HTML5 games a few years ago will have heard of this popular game engine. It was a paid-for product but has just been MIT licensed. Themify: CSS Theming Made Easy — A PostCSS plugin for generating site themes during build. Particle Effects for Buttons — Disintegrate elements into particles to make them disappear (or vice versa). Ideas for Proximity Feedback with Progressive Hover Effects — Experimenting with hover effects that trigger when an element is approached.